It was December 1972 and the day of my departure from Idaho Falls en route home in California. After a year of navy nuclear power school, I was done with my education. The temperature at dawn was (something like) 26 below zero. My car was frozen and had to be towed to a local station where they heated it up (I watched as the mechanic built a little fire under the oil pan) until it could be started. On the road at about midday, I became terrified at the start of the journey. Eighteen wheelers traveling at 60 MPH on the iced over highway to Pocatello were life threatening. Gradually building up courage, I increased speed until I could keep up with them. Then came the big mistake, I hit the brakes and traveled sideways off the road and skidded to a stop in sagebrush. A friendly guy about my age (at the time) showed mercy and towed me out of the snow and back onto the highway. The first night of the trip was spent in Jackpot as the highway south was closed just south of the Idaho border. The roads opened about 9 AM the next day and I continued on. After several hours I reached Winnemucca and stopped as I 80 was again closed due to the weather. Undaunted, I found a room and later sat down to play some blackjack. I won a few hands and the next thing I knew, a young lady was cheering me on. I definitely didn’t mind. We became a gambling team and moved on to a roulette wheel where I continued my winning streak. When it appeared that I should quit while I was ahead, I invited the young lady to dinner. We had a good time. In the morning, I invited her to breakfast and we discussed how I should spend my winnings. I suggested a dress for her and she accepted. Then we went to a local pawn shop to see what I could purchase for myself. I stopped at the door and immediately spotted a double-barrel shotgun sitting on a ledge just above eye level. For $100, it was mine. With my winnings spent and time a wasting, I bid farewell to the young lady, sent her on her way home to South Dakota and hit the road again. After a night of snowstorms and whiteouts (twice running off the road and bypassing a closed I80 at Donner Pass by taking the Tahoe route) I made it to my parent’s house about 1:00 AM in the morning. The shotgun became an afterthought. Although I made an uninspired investigation, I never figured much out about its history and it has languished in my closet, gun case or gun safe ever since. I fired it with black- powder shells at least once. Because it has Damascus barrels, I’ve been afraid it might blow up. 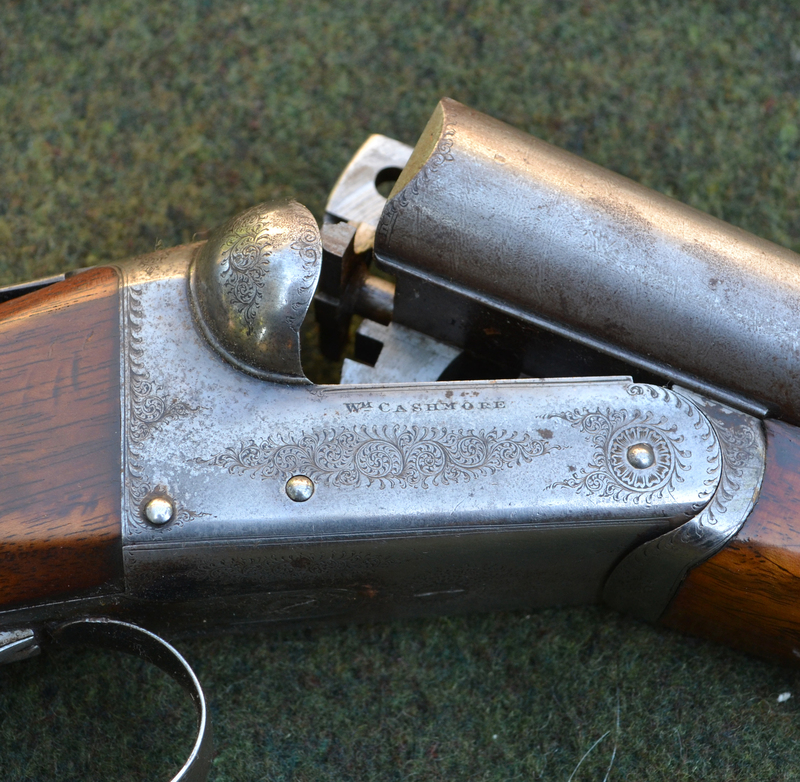 I was pleasantly surprised when I found some info, so rather than belabor that effort, I turned the issue over to my cousin who is currently doing some research, but if you’re interested in old shotguns, you may enjoy viewing the old gun, which has seen better days and was apparently fired many times before landing in the Winnemucca pawn shop. 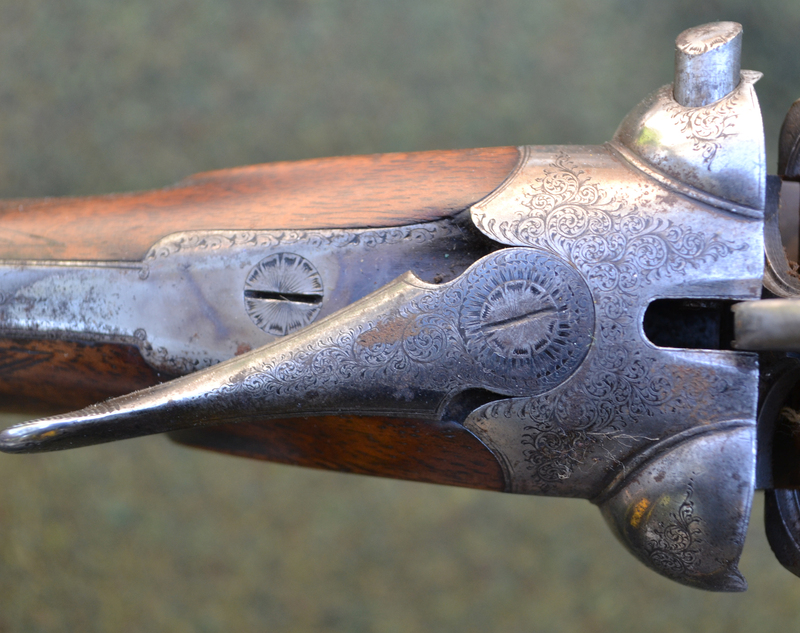 The gun is quite warn, but has lots of intricate engraving. Here’s a right side view, very similar to the left side if not identical. Here’s a top view. Everything works, but it needs an overhaul. 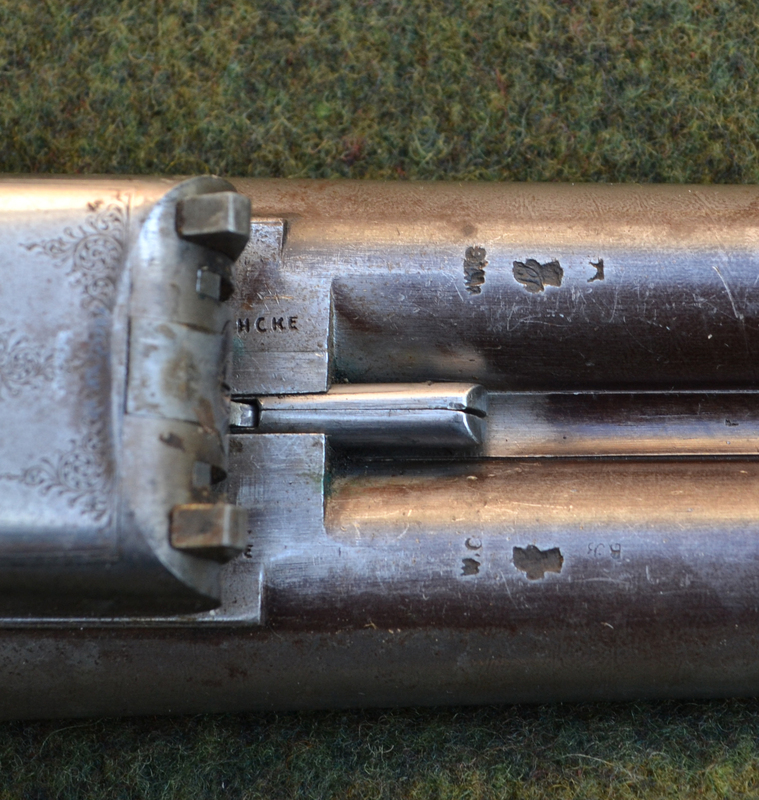 I’m interested in learning more about these barrel markings. The serial number, 9267, is quite clear. 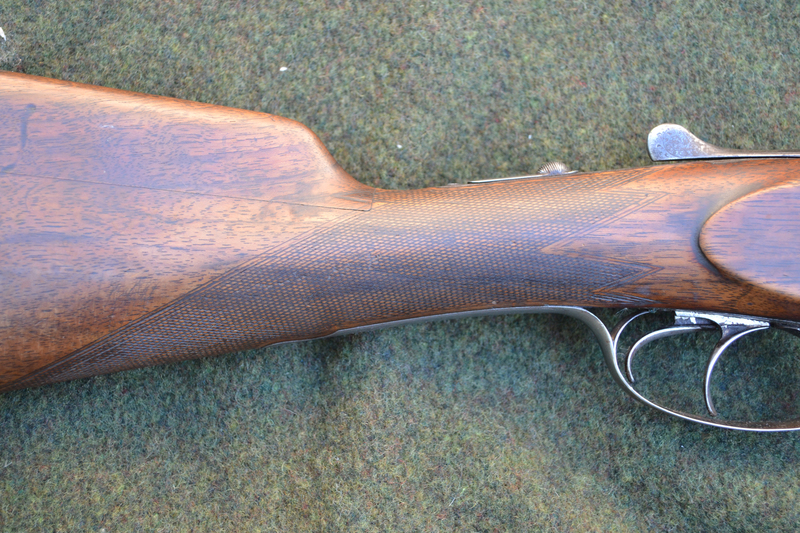 The fore stock has nice checking and engraving, but once again, overall the gun has deteriorated. The stock checkering is intricate. 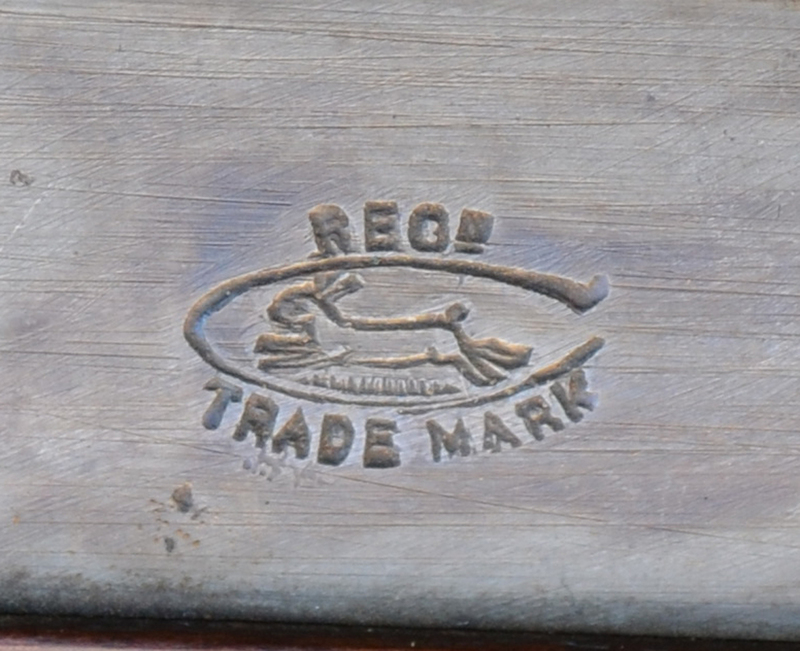 I found the trade mark under the fore stock. I’ve always wanted to learn more about the old double, so if anybody has info, feel free to pass it on. I’ve had it for forty years now, so it’s about time to figure it out. Although the number of hunters was a little higher than hoped for, overall our X-12 deer hunt was a positive experience. 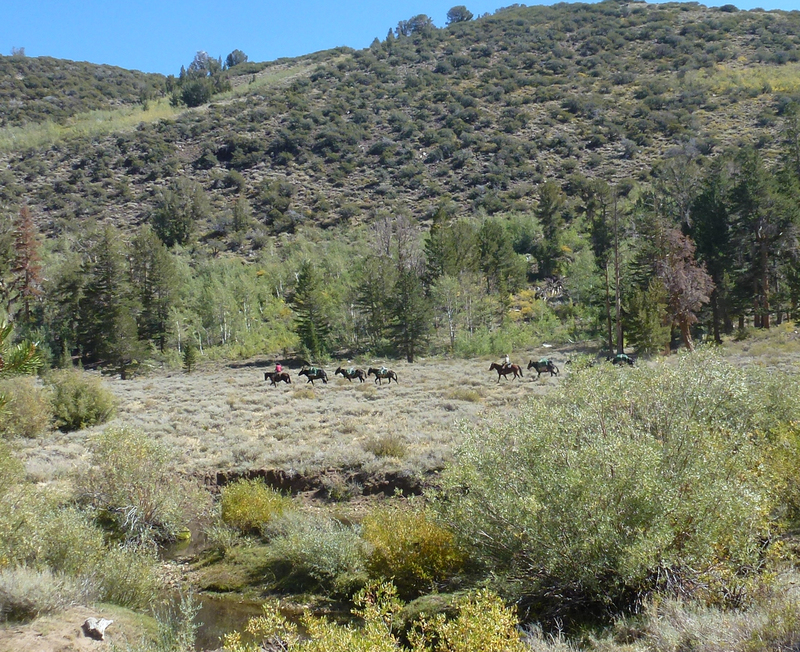 When we found out there would be ten hunters camped on our trail within a quarter-mile of each other, we were a bit discouraged. However, we managed to get along well with our neighbors and minimize interference with each other. A few other hunters wandered into the area as well and after opening day, it became a bit tough to find a buck. As for me, I set up a spike camp a couple miles away and was fortunate enough to find a decent buck on opening day. 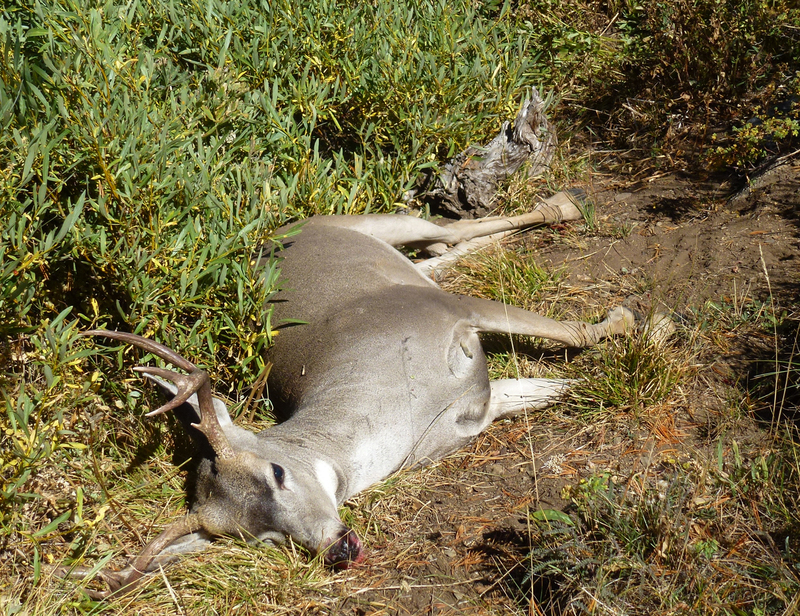 Still hunting through fir trees at about 10,000 ft, I surprised a small group of deer that included a 3×4 buck. From 50 yards, I didn’t miss and he went down in a hurry. I was satisfied to be able to hike the mountain and bag a fine buck once more. I never know how many more chances I’ll have. The hiking and climbing was both invigorating and tiring. Here are a few shots of the hunt. 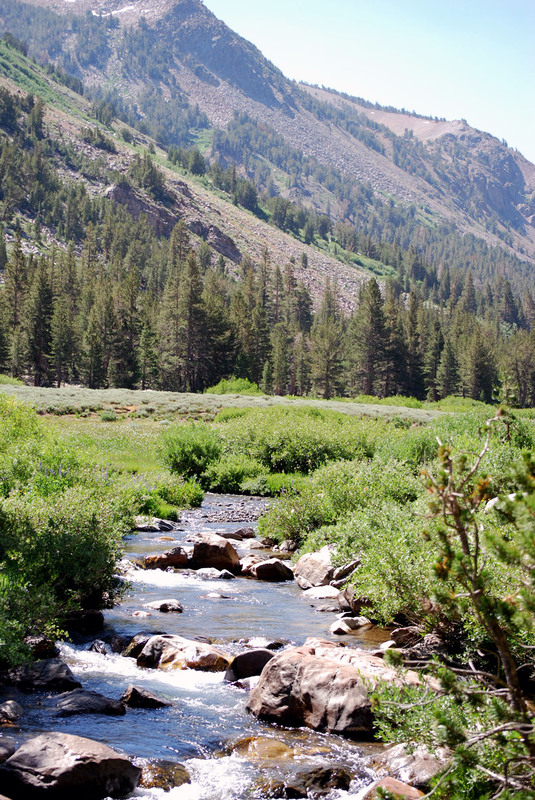 The X12 deer zone has some of California’s most beautiful wilderness. The 50 yard quartering away shot hit his heart. Although alerted by other deer, he never saw me. After a run-in with a bear in camp, most of him is now safely in my freezer. 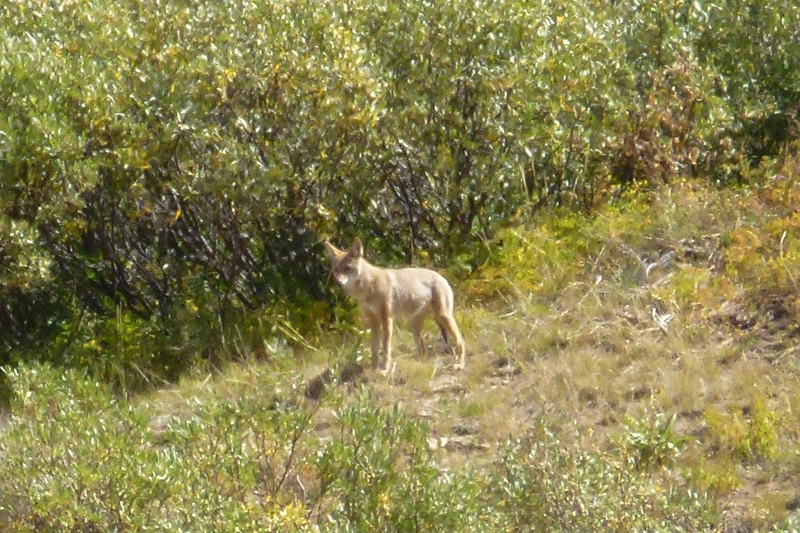 This blonde coyote greeted me with howling at spike camp. Rob and Joe caught a few nice brook trout in this pond. Joe and I with a hero shot. Joe’s buck was the best buck taken that I knew of. Several packers provides services in the X12 area. 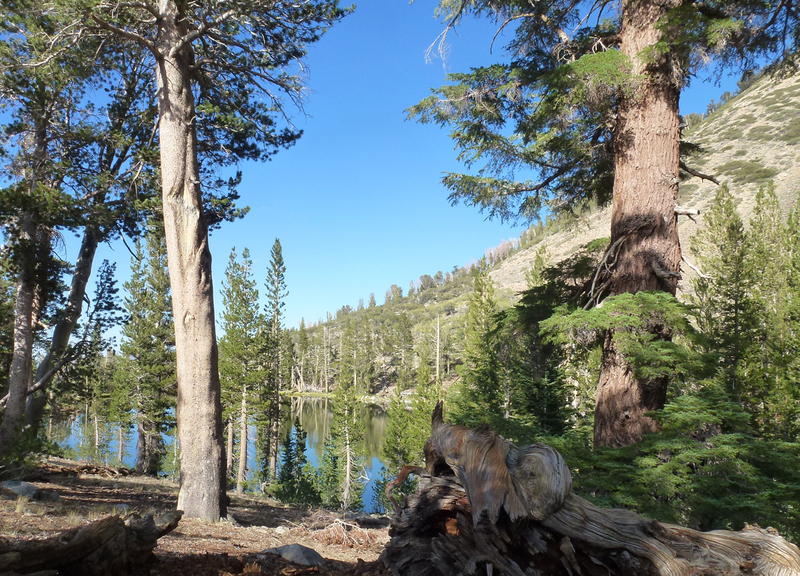 Two of them are Leavitt Meadows and Virginia Lakes Pack Stations. These are courtesy of Sherry Wiggens and others. Here’s the link. I’ll post more info when time allows. Thanks again to all who participated, donated and volunteered. Please Veto SB1221. This is a case of the majority taking freedom away from a minority. 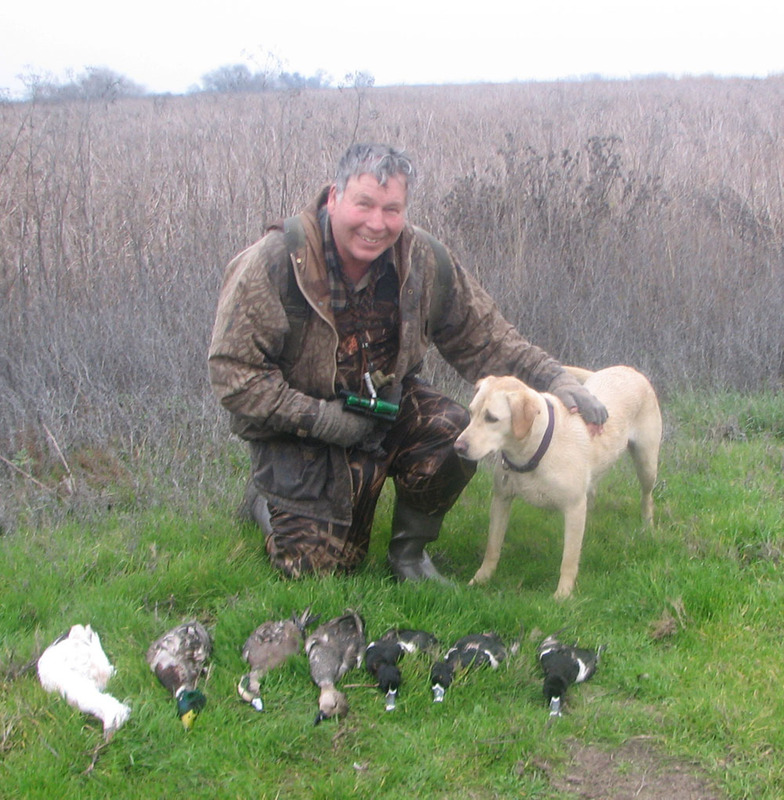 Hound hunting produces revenue that is beneficial to all wildlife management. This is your chance to be a voice of reason. Almost as Good as Hunting, but not quite. Large expanses of open water are very attractive to pintail, widgeon, shoveler and teal. For mallards, hunt ponds less open water where they can hide from view. 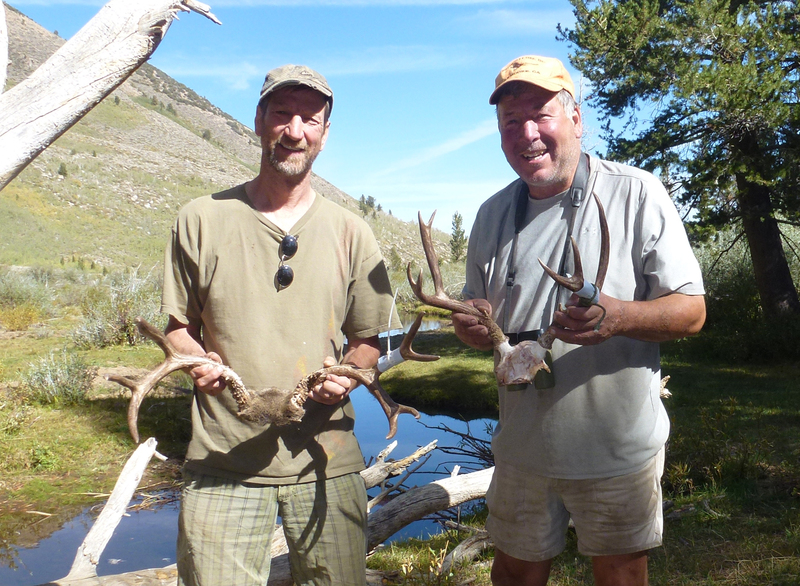 With a good draw and a full day of hunting, most refuges can produce a mixed bag like the one shown. First reason: When the public areas are good, there’s nothing better. Most of the public areas have excellent habitat. Most clubs cannot afford to create natural habitat. I enjoy hunting in natural shallow ponds, rimmed by alkali bullrush. To me this is the best type of habitat for duck hunting. Second reason: I have many fond memories of trips taken over the years. Many stand out and I enjoy returning to the scene of previous hunts and finding out how my favorite locations hunt today. Most of the time, ponds hunted in previous years tend to be pretty much the same. It’s like visiting an old friend. 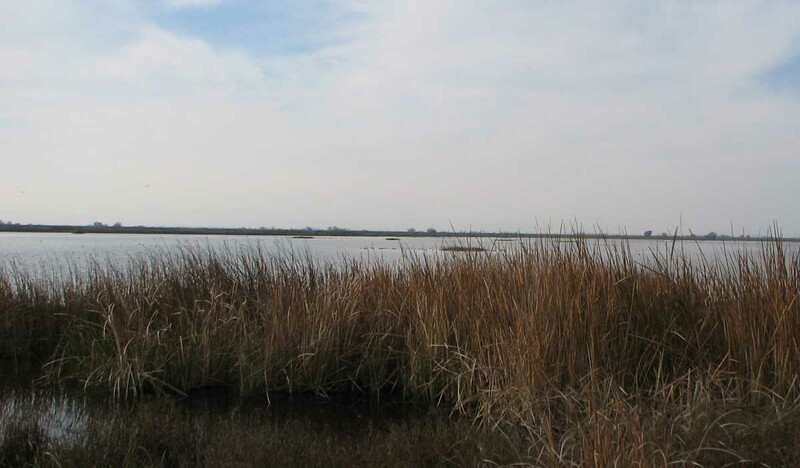 Third reason: If you want to make the most of your waterfowl hunting, you need options. The more the better. There are plenty of others….